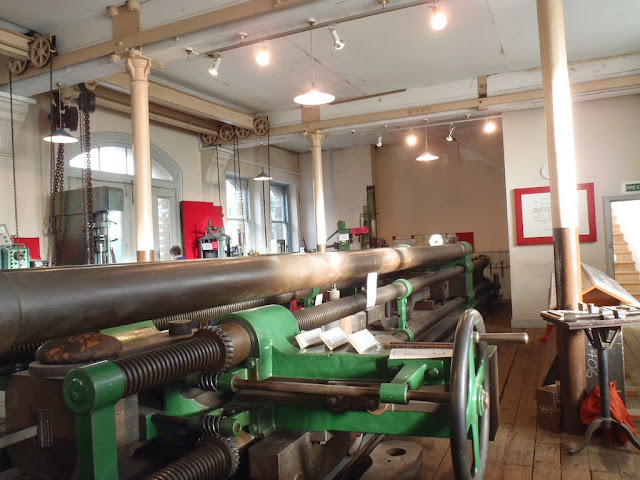 Today, as the first Sunday of every month sees the opening of one of London's more unusual museums, the Kirkaldy Testing Museum, affording Londoners the chance to step inside David Kirkaldy's Victorian testing works at 99 Southwark Street, a short distance from London Bridge Station. If you have always wanted to go but never found the time to visit the Museum, it is probably a good idea to seize the day, as the Museum's website tells us that there may only be 3 more openings before the lease expires in June, after which it may be forced to close. We are told that a section 25 notice has now been served on the museum to end the lease, and the trustees have are negotiating with the landlord over its future. The existence of the Museum had previously been safeguarded by the existence of David Kirkaldy's huge testing machine - a huge beast constructed in Leeds especially for the space in the 1860s and weighing 116 tons - which was deemed part of the listed structure of the building. However, now it seems relationships between the Museum and the landlord have deteriorated, and the trustees' refusal to endorse a proposal for conversion of the ground floor and basement into a restaurant with the machine retained as the centrepiece has surely not helped. Whatever happens, it seems opportunities to enjoy this unique place in its current format are very limited, so it is worth making the trip today.